Lauren Castillo joins us today! The thing I love about Lauren’s work is that it’s just so classic. I’d always envisioned her working quite traditionally on fancy thick watercolor paper. So I was surprised to handle some of her finished art recently and discover that she works on regular old drawing paper out of a pad! Lauren’s latest book, The Reader, just came out. She’ll be touring the Internet to talk about it, and we are her first stop (scroll to the bottom for the rest of the tour schedule). Process geeks—I include myself here—you are in luck. 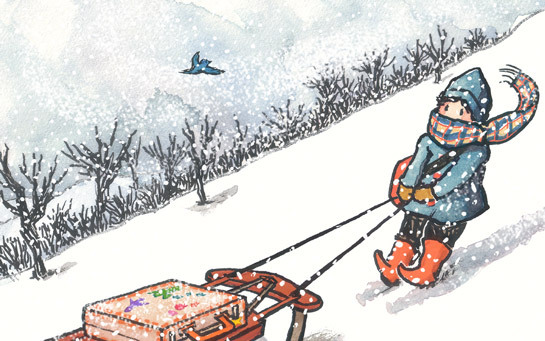 Below, Lauren shares how she made the illustrations for The Reader, in juicy detail. Caffeine of choice: Coffee, Italian-style. 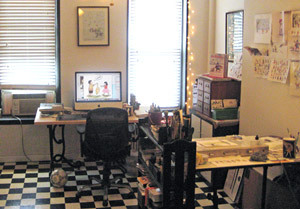 Workspace: I have a studio in the front part of my railroad apartment. YouTube video you can’t stop watching: This video inspired my upcoming book as author, The Troublemaker. Gets me every time! Let’s talk about process. 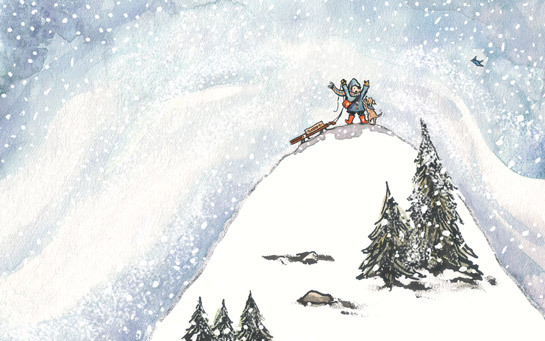 How do you make the illustrations for a book, start to finish? 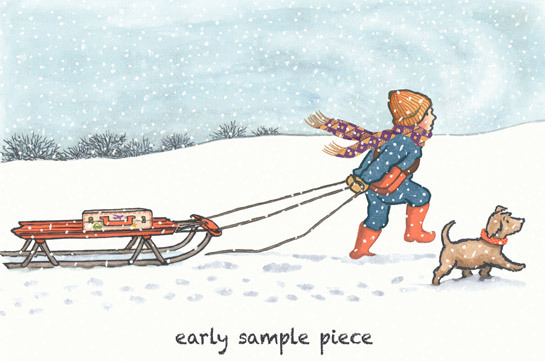 When my editor, Melanie Kroupa, sent over the manuscript for The Reader, I knew right away that it was a story I’d LOVE to illustrate—a boy, a dog, and snow! What could be better? And, after reading the sweet text by Amy Hest, I was SOLD. But the more I drew, the more it became clear that he would be smaller—much younger and more playful. So, after a lot of scribble-filled sketchbook pages, I finally got him just right. 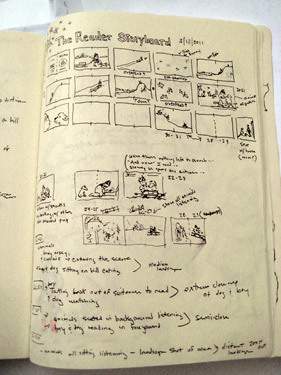 The storyboard in Lauren’s sketchbook. Now that the characters were worked out, I could easily jump in to the storyboarding! 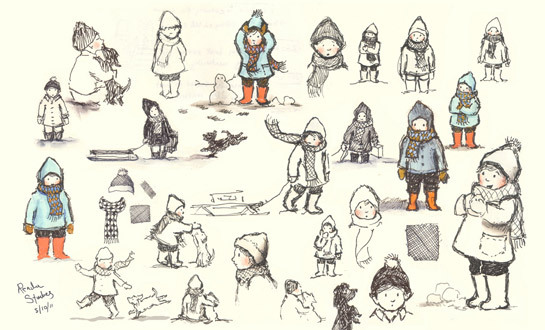 I started by drawing very tiny thumbnails in my sketchbook (I mean realllly tiny. Actual thumb nail size. I love to work small!). I drew out the whole story, and then jumped on the computer to scan and enlarge all those tiny thumbnails to the actual book size. From there, I went through and selected the best sketches to start to put together a final storyboard. This stage kind of feels like figuring out a puzzle—you have to put all the right pieces together. I use Adobe InDesign to lay out all my books, and it’s something that’s really necessary for me to visualize how each spread works with the type in place. I can easily see here how the flow of the book is working. What pages need to be redrawn, or what compositions need to change. I often do my sketch revisions in Photoshop, and I’ll also drop in color to begin figuring out the palette. Once the sketch dummy was finished, and approved by everyone involved (editor, art director, publisher, author), I did a few color studies and line tests to make sure I had the medium figured out before jumping in to final art. 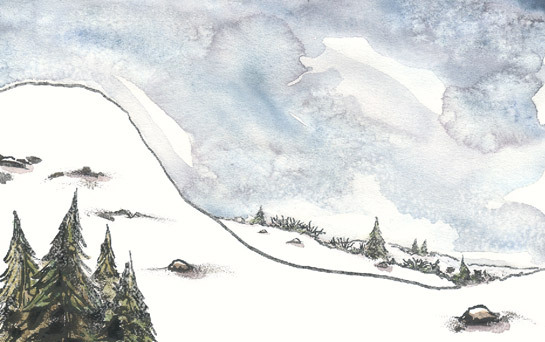 I wanted to create the artwork for The Reader pretty traditionally, with ink and watercolor, and that’s mostly what I stuck with. I did end up throwing in some marker here and there, and I also used salt in my painting (an old art school trick). I sprinkled the salt on to the watercolor skies while the paint was still wet, which creates a really great texture and the feeling of a blustery day. The salt technique at work. 1. I am more comfortable working at a small size—I’m able to create a more energetic line when I draw tiny. 2. 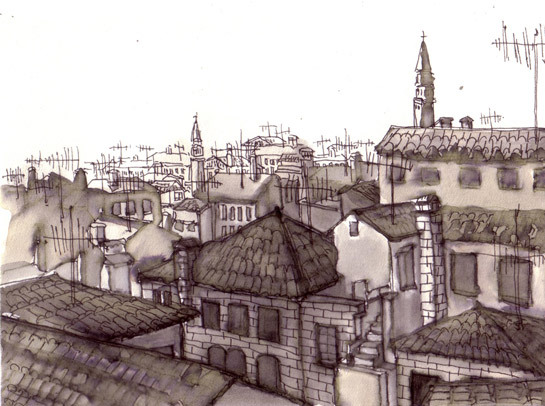 I love the way ink and watercolor looks when it’s enlarged. The texture is really visible. After all the paintings were complete (this took a good 3 months), I scanned and enlarged them to book size. My next and final step was to create some additional layers of snow by hand, that I would then place over many of the paintings to make them look extra snowy. 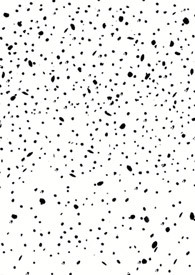 I drew the snow using black ink, and then scanned and brought it in to Photoshop where I filled the black snowflakes with white. AND FINALLY: You’re on Project Runway, except it’s been renamed Project Runaway Bunny and is about picture books instead of fashion. Your mission: spend ten minutes in the grocery store, choosing supplies to illustrate your next book with. What do you get, and why? But will it wake you up in the morning? You can purchase The Reader here. 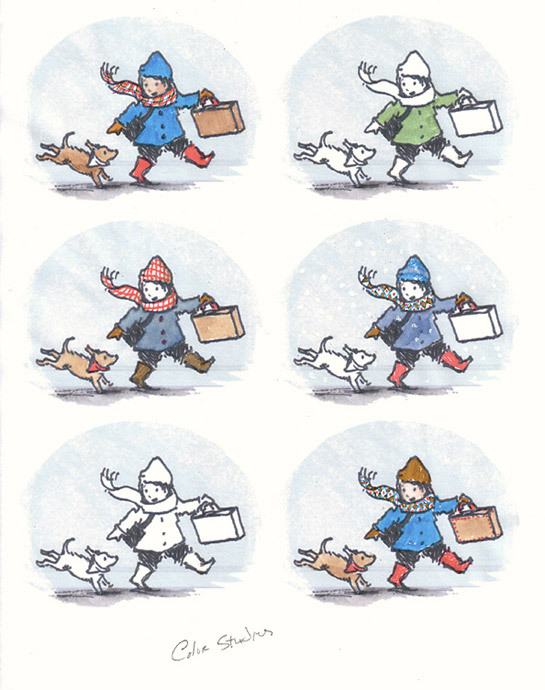 Oh, and I just saw the 7-Imp shout-out. Many thanks! …I have a feeling you’ll be a frequent answer to that question! Lovely interview, Lauren and Jules! 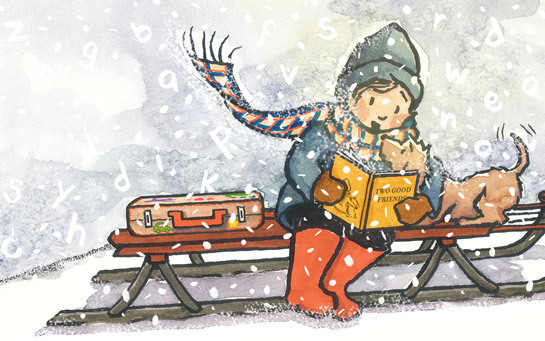 The letters joining the snow are a very nice and thoughtful touch. Thanks! Very cool to see the iteration process! I love Lauren’s style! Thank you for sharing your beautiful work, Lauren. So funny to see Henry’s Awful Mistake in your post. That was one of my favorite books as a kid too! I think the reason I was fascinated by it was that it stressed me out so much! I read it to my kids once and I realized I had PTSD from it. Lauren, I love the progression of “the wind blows…” spread and how you finally resolved it! Can’t wait to read the whole book.